Letter: What Kind of Revolution? Greasy Pole: European Union? Civil War? Material World: Population - What Explosion? who’s ‘leaked’ e-mail initiated the coup against Boris. The global toll of more than 800 000 deaths by suicide every year. Suicide is the second leading cause of death worldwide among 15–29 year olds. One might think that the countries where most poor people live would be classified as poor themselves. But they aren't. In countries recently reclassified as middle income, the majority of the population remains poor even as the country might be getting richer because wealth remains concentrated in the hands of the rich. This inequality is often further exacerbated by factors such as race, gender, caste or the rural-urban divide. This is amply illustrated when you compare the share of income or consumption of the bottom 10 percent with that of the top 10 percent in various countries. In an upper-middle-income country like Brazil, for example, the bottom 10 percent is responsible for just 1 percent of total consumption while the top 10 percent consumes almost 42 times as much. In India, the bottom 10 percent accounts for just 3.5 percent of the total consumption, while the top 10 percent accounts for 30 percent. With a population of over 204 million, the Indian state of Uttar Pradesh would be the fifth most populous nation in the world -- after China, India, the US and Russia -- if it were a separate country. But it would also be extremely poor, with very poor development indicators and high levels of deprivation. The share of children affected by malnutrition and the infant mortality rate would be similar to or even higher than in those designated as low-income countries by the World Bank. But Uttar Pradesh is part of India, which is classified as a middle-income country (MIC). Over 75 percent of those suffering from extreme poverty in the world live in countries that are considered middle income. India alone is home to 275.9 million of the poorest, living on less than the $1.90 per day used by the World Bank as the cut-off for extreme poverty. All other lower income countries -- located mainly in sub-Saharan Africa with a few in Asia, such as Afghanistan, Nepal and Cambodia -- have just 258.3 million put together. The UN's 2015 report on global hunger shows that lower-middle-income countries account for over half the hungry people in the world compared to just 18 percent in low-income countries. The classification of countries is done annually by the World Bank based on the previous year's per capita Gross National Income (GNI). In recent years, several countries have moved from the low-income group to the group called lower-middle-income countries, a sub classification of MICs. But if MICs are home to the largest number of people suffering from extreme poverty, how can they be classified as middle income? The answer is that their per capita GNI --or the total national income divided by population -- exceeds a critical threshold: per capita GNI of $1,045. MICs are those with a per capita GNI of more than $1,045 but less than $12,736. Within this category, those countries with per capita GNI of below $4,125 are further classified as lower-middle-income economies. The re-categorization of low-income countries as lower-middle-income countries not only hides the fact that the majority of the world's poor actually live there, but the subsequent loss of concessions could lead to even higher levels of inequality, especially on something as basic as access to health care. Most major pharmaceutical companies like Merck, Pfizer and GSK have stopped providing preferential pricing or reduced prices on many important drugs to middle-income countries. "Over the last two years, lower-middle- and middle-income countries have been locked out of company discount programs and are forced to negotiate prices on a case-by-case basis, which has led to higher prices," noted Doctors Without Borders (MSF) in a 2012 press statement. For the pharmaceutical companies, this is a good deal of course -- even if the majority of the population cannot afford the higher drug prices. Brook Baker, a senior policy analyst for the Health Global Access Project, a non-profit organization based in New York, was quoted in Nature magazine as saying that in middle-income countries with high income inequality, companies make more money selling drugs to rich people than they do selling to the 90 percent of people who are poor. After all, the richest 10 percent of the population in many of these countries often includes several million people. In Bangladesh, with a population of 156 million, for example, the wealthiest 10 percent accounts for more people than the population of countries like Belgium, Sweden or Greece. The pledges made by countries at the COP 21 Paris agreement in December 2015 on climate change would lead to “completely catastrophic” global warming, scientists have warned. In a major analysis of 10 different studies into the effect of what world leaders promised to do, researchers calculated that the planet was still on course for a temperature increase of 2.6C to 3.1C by the end of this century. Their finding was in sharp contrast to the declaration in Paris that action would be taken to keep the rise to “well below” 2C and try to restrict it to 1.5C. In the journal Nature, a team of academics said that their projections based on the promises made by nation states at Paris showed the world was facing an “important challenge”. Mark Lynas, the author of the award-winning book Six Degrees: Our Future on a Hotter Planet, predicted that three degrees of warming would have a devastating impact on the world. For example, the Indian monsoon, which was a week late this year and is essential for billions of people, would likely fail, the Amazonian rainforest would dry out and life in much of South America would become increasingly difficult because of the searing heat and smoke from wildfires, and the west coast of the US – already suffering from severe droughts – would suffer from rampant wildfires and a lack of water to fight them. New York City would experience regular flooding, extreme Atlantic storms would hit the UK, Spain and France while countries around the Mediterranean would start to develop new deserts. Vast numbers of people would be forced to move as large areas of Africa in particular become uninhabitable, leading to conflict and war. 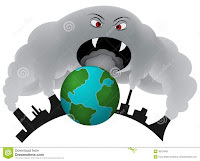 It would also, Mr Lynas warned, cross a number of “tipping points” that would speed up the rate of climate change with wildfires releasing vast amounts of carbon dioxide into the atmosphere. A man claiming to be an employment agent approached the mother of a 19-year-old woman with an offer: her daughter could work in a New Delhi household and send money home to her impoverished family. The mother never received a rupee, and she didn’t see her daughter for two years, until she was freed two months ago after an intervention by an NGO. The woman is still too traumatised to speak about her experience. The United Nations refugee agency says 10,085 people have died trying to cross the Mediterranean Sea to get into the European Union since 2014. The UNHRC said the number of migrant deaths at sea has risen sharply in 2016 -- reaching a total of 2,814 since the start of the year. For one million children in 2015, their first day of life was also their last. Millions of children still die before reaching their fifth birthday every year, according the UN Children’s Fund (UNICEF). The United States has a higher infant mortality rate than most high-income countries, and the odds of survival are closely linked to racial inequality: In 2013, infants born to African American parents were more than twice as likely to die as those born to white Americans. The report estimates that if all mothers achieved secondary education, there would be 1.5 million fewer annual deaths of children under age 5 in sub-Saharan Africa and 1.3 million fewer in South Asia. The number of UK children living in poverty jumps by 200,000 in a year. There were 3.9 million children living in “relative poverty” in 2014-15, up from 3.7 million a year earlier, the figures from the Department for Work and Pensions show. The number of people classed as living in “relative poverty” after housing costs increased to 13.5 million in 2014-15 from 13.2 million a year earlier (an individual is considered to be in relative poverty if their household income is less than 60% of median income). The Queen’s property portfolio value rose nearly 10 per cent to £12 billion this year with the Treasury scooping a record £304.1 million in profits. The Crown Estate, which owns most of the shops, offices and apartments on Regent’s Street as well as much of St James’ Street, contributed more than £30 million pounds more to the public coffers this year than in 2015. The monarch has one of the largest property portfolio holdings in the UK and this year the Crown Estate, which manages it, achieved a market beating return up 6.7 per cent on 2015 following the £1.5 billion it invested in regenerating Regent Street and St James’ Street. In 2015/16 it earned £92.6 million in revenue from West End retail and £75.4 million in revenue from central London office rents and £39 million from residential lettings in the capital. 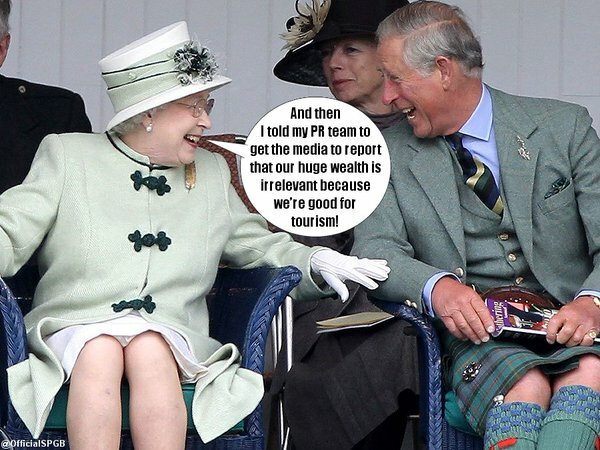 The amount of money the Queen receives from the property portfolio is set at 15 per cent of The Crown Estate’s profits meaning that this year she got £43 million and if it stays the same she can expect to receive £45 million next year, compared with £31 million in 2012. News of the upsurge in profits comes ahead of a review of the amount of money the Queen receives from the Treasury, known as the Sovereign Grant. The grant, which is paid every two years and reviewed every five, was set at 15 per cent in 2012. In a paper in the Journal of Medical Ethics, the ethicists, Dr John-Paul Sanggaran, of the University of New South Wales, and Professor Deborah Zion, of Victoria University, claim that there is “increasing evidence that Australia is engaged in torturing asylum seekers” with refugees imprisoned for more than a year without trial. “There are allegations of situations, circumstances and actions that also constitute cruel and unusual punishment throughout Australian immigration detention,” they wrote. They pointed to allegations by guards at a detention centre on the island of Nauru “of waterboarding, familiar to most as a torture technique that simulates drowning used by the Central Intelligence Agency (CIA) in places like Guantanamo bay”. There are allegations of waterboarding, another method of torture called “zipping” in which people are tied to a bed that is then thrown into the air, sexual assault and exploitation, and child abuse. And the inmates of detention centres created outside of Australia to avoid its laws are held in conditions of secrecy that prevent scrutiny of their treatment while laws prevent doctors speaking out about mistreatment. “‘Zipping’ is described as tying an individual to a metal bed frame with cable ties, the bed is then thrown into the air causing injury to the bound individual when the frame crashes to the ground,” they added. In another article in the journal, Professor David Isaacs, who provided paediatric services at an immigration detention centre, said the prolonged imprisonment was “arguably to coerce asylum seekers into voluntarily returning to their own or another country and to deter others from seeking asylum”. The consequences of such detention were “severe mental health problems including anxiety, depression, posttraumatic stress disorder, self-harm and suicidality”. A Montréal firm can shift its ‘head office’ to a tax haven and workforce abroad, but Ottawa will continue to use its diplomatic, economic and military might to advance the company’s international interests. The Toronto Star recently reported that Gildan Activewear paid only a 2.8% tax rate on more than $1.3 billion US in declared income the last five years and it’s unclear if any of the apparel company’s measly $38 million in tax was paid in Canada. After benefiting from government subsidies and financial backing from Quebec’s Fonds de solidarité labour investment fund, Gildan opened a subsidiary in Barbados sixteen years ago to sidestep Canadian tax. The firm took advantage of a tax treaty that permits companies to repatriate profits from the small Caribbean nation, which has a 1.5% corporate tax rate, without being taxed in Canada. Concurrently, “free” trade agreements have enabled Gildan to shift its unionized Canadian and US production to Honduras, Nicaragua, Dominican Republic and Haiti where it’s pursued aggressive anti-union “sweatshop” policies. Without a high-profile brand name (until recently) Gildan has focused on producing T-shirts and socks at the lowest cost possible. Any increase in the dismally low wages it pays in these countries is a threat to their ultra-low-cost production model, which competes with even lower wage jurisdictions in Cambodia and Bangladesh. Despite Gildan moving its production to low-wage jurisdictions and its headquarters to a tax haven, Ottawa has continued to advance the company’s interests. In 2004 Ottawa helped overthrow Haiti’s elected government and backed a military coup in Honduras five years later partly to protect Gildan’s ultra-low-wage production model. At the start of 2003 Jean-Bertrand Aristide’s government increased the Haitian minimum wage from 36 gourdes (US$1) a day to 70 gourdes. Of course, this was opposed by domestic and international capital, which used Haiti’s lowest wages in the hemisphere as a way to beat back workers’ demands in other Caribbean and Central American countries. At the time most of Gildan’s work in Haiti was subcontracted to Andy Apaid, who led the Group 184 domestic “civil society” that pushed to overthrow Aristide’s elected government. Coincidentally, two days after the US/France/Canada coup, Foreign Affairs stated, “some Canadian companies are looking to shift garment production to Haiti.” By 2009 Gildan was the country’s largest employer after the state, employing up to 8,000 Haitians (directly and indirectly) in Port-au-Prince’s assembly sector. Honduras President Manuel Zelaya raised the minimum wage by 60% at the start of 2009. Gildan’s opposition to Zelaya’s move to increase the minimum wage was one reason Ottawa tacitly supported the ouster of the elected president later that year. Under pressure from the Maquila Solidarity Network, Nike, Gap and two other US-based apparel companies operating in Honduras released a statement that called for the restoration of democracy three weeks after the military overthrew Zelaya. With half of its operations in the country, Gildan refused to sign this statement. Since the coup Gildan’s Honduran workforce has grown from 11,000 to 26,000, making it the largest private employer in the country. A Globe and Mail Report on Business profile described Gildan as “the ultimate fruit of globalization.” A firm that pays little tax, low wages and that employs the state to advance its interests —capitalism at its finest. Taken from an article by Yves Engler. torture and murder to suppress the 1950’s Mau Mau rebellion. Will haunt them all and how! If they were on our side. Will settle out of court. The Commies or the Yanks! Or some such load of balls. And now we’re going to pay. and 1000 were hung. A policeman who resigned had his letter suppressed. EOKA (AY-OH-KA) were the ‘terrorists’ in British colonial Cyprus in the 1950s. (2) 1.5 million Kikuyu owned 5,200 sq km of land—30,000 white settlers owned 31,000 sq km. The gap between rich and poor has widened in the last decade, the new figures from Statistics NZ show. The richest 10 percent of Kiwis have hoarded more than half the country's wealth, with the bottom 40 percent scraping by with only 3 percent. The top 5 per cent of individuals held around 45 per cent of the wealth, while the top 1 per cent held about 22 per cent. Between 2003 and 2010, the top 10 percent had around 55 percent of the wealth. This has expanded to 60 percent over the last five years. As of June 2015, the average household net worth was $289,000 -- but one in 20 households owe more than they own. Inequality is stark between ethnic groups. While the British and much of the World’s media dwell upon the EU referendum result, 69 million children will die of preventable causes by 2030, says Unicef. The report says that the World’s most disadvantaged are still missing out: the poorest children are still twice as likely to die before their fifth birthday, and be chronically malnourished, as the richest. In sub-Saharan Africa, that figure is even bleaker: children will be 10 times more likely to die before their fifth birthdays than children in high-income countries by 2030. The continent, one with a wealth of natural resources, will also be home to nine out of 10 children living in poverty. Again, sub-Saharan Africa fares badly with the report forecasting that by 2030 the region will account for more than half of the 60 million children of primary school age who are not in school. The global air pollution crisis is killing more than 6 million people a year. Air quality has been identified as the fourth-largest threat to human health, after high blood pressure, poor diet and smoking. Eight in 10 of the cities around the world that monitor the problem exceed the levels at which harm is caused. The energy industry is a leading source of pollution – including sulphur and nitrogen compounds – that cause breathing difficulties in vulnerable people, including children and older people, and can lead to premature death. Energy production and use account for about 85% of particulate matter and almost all of the sulphur oxides and nitrogen oxides. Another key problem is that about 2.7 billion people around the world are still dependent on wood and waste fires that cause indoor air pollution, affecting women and young children the most. Air pollution from agriculture should be a concern for governments, as fertilisers used on intensively farmed fields can cause problems both for air pollution and agriculture. Nitrous oxide and ammonia, arising from fertilisers, are more powerful than carbon in terms of trapping heat in the atmosphere, and can combine with other emissions to form more harmful gases. Capt. William Boreham will be stripped of his Military Cross medal, the third highest award for battlefield bravery, after an internal investigation found commanders had apparently exaggerated his actions. He was awarded the prestigious gallantry award for rescuing a badly wounded comrade, while "fighting off a deadly insurgent attack", and coming under heavy fire from Taliban fighters. But after concerns from other soldiers who had been on the September 2012 patrol in Afghanistan’s Helmand province, an investigation has found there was little or no enemy fire at the time. Major Robert Armstrong, of the Royal Artillery, had a Military Cross withdrawn two years ago when an investigation found he had helped to write his own citation and took credit for the bravery of others during a Taliban attack. Two junior non-commissioned officers who received Mentioned in Dispatches (MID) in the same action in which Maj. Armstrong won his MC have told military investigators that they do not recognise his version of the event. The NCOs, both corporals, were surprised to learn that they had received "MIDs" given that the incident did not take place under enemy fire. The World Wealth Report from Oxfam, Greenpeace, and other groups found that while the total number of millionaires in the world jumped to 15.4 million—up by nearly 5 million since 2009—more than 702 million people remain in poverty around the globe. For every person with more than $30 million, there are over 4800 people living in extreme poverty. Jenny Ricks of the Fight Inequality Alliance explained, "This gross inequality is a symptom of an unjust and unfair economic system that allows the rich to get richer at the expense of the poor." 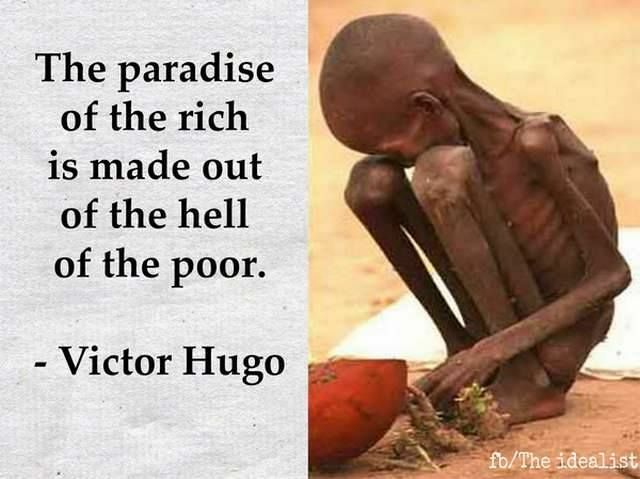 Ricks continued, "Last year the wealth of the richest totalled $58.7 trillion, which is over 150 times the size of the economies of all of the world’s poorest countries combined. 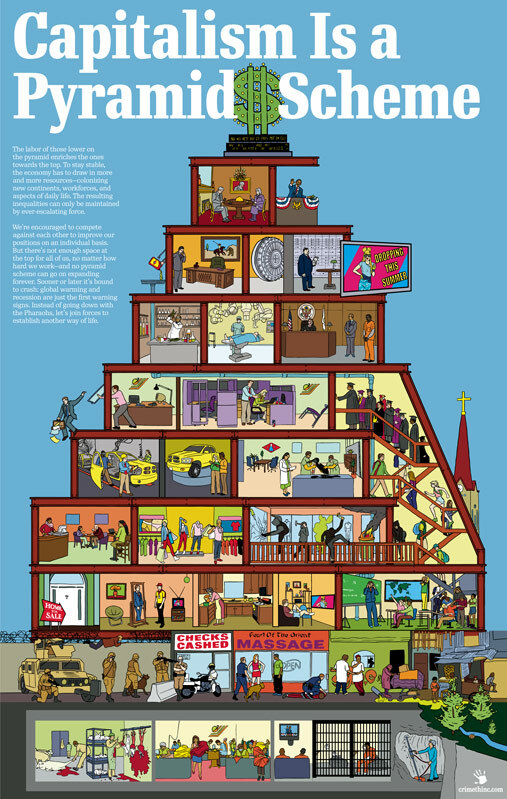 This shows the extent money and power are concentrated in the hands of the wealthiest few." Global HNWI [High Net Worth Individual] wealth expanded fourfold over the last 20 years to reach US$58.7 trillion in 2015. Global HNWI wealth is projected to surpass US$100 trillion by 2025. Whinge, whine, moan, complain, hold up a protest placard, write to your political representative, vote for reform party X. But if you really, truly want change, you have to stop looking for it in the current, capitalist economic system. People should have woken up to this fact by now. Whinge, whine, moan, complain, hold up a protest placard, write your political representative, vote for reform party X. But if you really, truly want change, you have to stop looking for it in the current, capitalist economic system. People should have woken up to this fact by now. The British voters’ decision to leave the European Union caused ripples across all major global equity markets. Bloomberg Billionaires Index says billionaires lost 3.2 percent of their total net worth, now estimated at $3.9 trillion. Brexit-caused losses of the world’s 400 richest people amounted to $USD127.4 billion in a single day, Bloomberg estimates. Altogether, Britain’s 15 richest people lost “only” $5.5 billion. British co-founder of stockbroker Hargreaves Lansdown, Peter Hargreaves, lost the most, seeing his fortune shrink by 19 percent to US$2.9 billion. Hargreaves was the largest donor to the Leave campaign, donating £3.2 million, according to the UK's Electoral Commission. Britain’s wealthiest person Gerald Cavendish Grosvenor dropped more than $1 billion. Amancio Ortega, Europe’s richest person, hemorrhaged $6 billion. Many other mega rich individuals took a massive hit, including Bill Gates and Amazon magnate Jeff Bezos, who lost over $1 billion each. The SOYMB blog is shedding no tears for those blood-sucking leeches. 400 people losing $127.4 billion is nothing comparing to 1.274 billion living on $0.40 per day. This is capitalism all over. The super-rich lose a bit of their money and it is news. The rest of us die in wars to make them rich and you hear hardly anything about it. We won't lose any sleep over concern for those poor ultra-wealthy elites who have lost some of the book-value of their ill-gotten gains garnered from the hard work of common workers. Brexit - So be it - We get it. Britain’s vote to leave the EU wasn’t an expansion of rights or a declaration of freedom from tyrannical rulers. It was a fearful expression of the rising tide of nationalism that is currently permeating many European countries and America. All the xenophobic right wing parties have expressed their enthusiasm for the Brexit, which is going to give them more push. Brexit comes after the Austrian elections, where the right wing lost for few votes. If elections were held today in the Netherlands, its xenophobic party would be the largest. And Donald Trump has expressed his enthusiasm for the Brexit. Geert Wilders, the leader of the Netherlands’ far-right Party for Freedom, congratulated Britain and Nigel Farage, the head of the far-right U.K. Independence Party, which helped lead the Brexit campaign. There are 3 million EU migrant workers in the UK, many of them working in manufacturing, wholesale and retail, and hospitality. Hospitality is the fourth biggest employer in the UK, with a workforce of 4.4millon - 70% of whom are migrant workers. It is also the most precarious and un-unionised with just 3.6% belonging to a union. Hotel housekeeping departments are mainly staffed by Eastern European women workers. Why should we care what happens to 'them'? Because what happens to them, in terms of access to employment rights and agency to challenge exploitation, will happen to us. Anti-immigrant fervour paved the way for the introduction of NHS fees for migrants through the Immigration Act 2014. Under tabloid-stoked banners of ending 'health tourism', the NHS now has a legal and administrative framework for a charging health care system. You don't need to be a genius to work out who else this will be rolled out to – everyone. So when we 'take our country back', are we going to take our workplaces back? Control over our own labour back? No one is talking about that. Why would the Tories abandon their trajectory of slashing and burning union rights, passing 11 restrictive acts between 1980 and 1996 and continuing with the strike-banning Trade Union Act this year? The capacity we need to ‘take back control’ is over our own labour, conditions and economic organisation. When migrant workers are the pawn in this game of EU and domestic class control, voting for a move which will exclude them, and normalise restrictions on their rights, will not encourage their participation in a political process which needs to include them as a part of the whole UK working class. Anti-immigration only resonates with certain parts of that class - those with employment, language and immigration status advantages. Myths and misinformation have been packaged in a way that both dehumanises the vulnerable migrants and thwarts solidarity from fellow-workers who have also suffered from the same unequal distribution of global wealth that drives much migration. Migration policy is already pretty dire. The Immigration Act of 2014 and 2016 and its various amendments has kick-started the process of criminalisation movement and policing people who appear ‘other’. British people earning below a certain income already face restrictions on who bringing foreign spouses to live with them here in the UK. Not to talk of destitution and incarceration of hundreds of refused asylum seekers and migrants. And even before Brexit, social welfare lawyers report a rising number of destitute Eastern Europeans with various restrictions on their access to benefits and housing. One of the few positives from the Brexit result is that there is now a growing chorus on the fact that globalisation has not kept its promises - wealth for everybody. On the contrary, it has created a dramatic social inequality, with few people having the bulk of national wealth, and many left out. It seems that those supporting Remain concentrated too much on attacking Brexit and failed to emphasise the title of the Socialist Party statement that "The problem is not the EU .. it's capitalism" and so neglected to address and challenge the thinking of workers in Leave areas that the EU was the cause of the problems they faced. "Joking aside, Brexit won't make any difference. The rich will still be rich, the poor will still be poor, and we'll still blame foreigners." The wealth gap keeps growing as the world's richest get richer at the expense of the poor. Who will they scapegoat for the tears? The number of people displaced from their homes due to conflict and persecution is now greater than the population of the United Kingdom, or of Canada, Australia and New Zealand combined. The Global Trends 2015 report now notes that 65.3 million people were displaced at the end of 2015, an increase of more than 5 million from 59.5 million a year earlier. The tally comprises 21.3 million refugees, 3.2 million asylum seekers, and 40.8 million people internally displaced within their own countries, says the new report, which has been compiled by the Office of the UN High Commissioner for Refugees (UNHCR). Measured against the world’s population of 7.4 billion people, 1 in every 113 people globally is now either a refugee, an asylum-seeker or internally displaced. Children make up 51 per cent of the world’s refugees in 2015, with many separated from their parents or travelling alone, the UN reported. The persecution of minorities in many countries has made more acute the problem of the refugee, seeking a land where he or she will be permitted to live in comparative peace. But with hardly a single exception there are no countries which will freely admit the penniless wanderer, no matter how good his or her credentials or how great the need. The truth is that capitalism to-day is an anti-social arrangement and produces anti-social ideas, even contradictory ones. Why should something as arbitrary as where one is born determine where one is allowed to live? The answer, sadly, is that under capitalism, artificial lines on maps divide the world into different camps, which enable those who own the earth to defend their bit of it and to make claims on other bits. A sensible society would have no concept of refugeehood or any of the other states of oppression. The real clamour to help refugees is not coming from governments, but ordinary people from all walks of life, organising as best they can, in their groups, communities, and often as individuals. 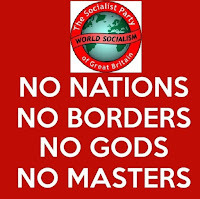 For socialists, it is reassuring that so many workers refuse to see those they are rallying to support as anything other than human beings, homeless, frightened, displaced, and have refused to see them as migrants, illegal immigrants, refugees, Syrian, Libyan, Moslem, black or any of the other categories into which our species is labelled and pigeonholed. It is an encouraging aspect the way that local people, from Sicily to Australia, have rallied to support and help refugees in their midst. It is one thing to rail against those who are allegedly coming to steal jobs or live as scroungers, but it is quite another to encounter the hopelessness and destitution of people who just want somewhere to live without persecution and bring up their family. We can only hope this solidarity grows into a revolutionary class consciousness – when these same workers demand the eradication of borders and frontiers and every other artificial boundary that divides us, realising that same solidarity can help us fashion a world in our own interests if taken a step further. It is hopeless to appeal to the conscience of political leaders who have been directly responsible for such a monstrous crisis. 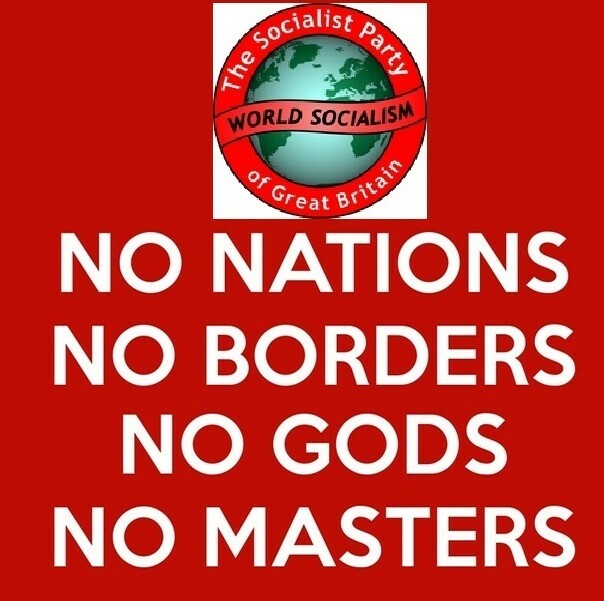 Far better to have a world where men, women and children can be free to travel over its surface without the futile restrictions of nationality, and where they can satisfy their needs from a sufficiency of wealth that only socialism can make available. What an extraordinary notion it is that so many members of the human race should be forced to remain on that small section of the earth's surface in which they happened to be born. Who gave the world's rulers the right to tell us which bit of land we should live on? The apologists for capitalism who try to foment ill-feeling towards "foreigners" arriving here, whether they come to escape persecution, or to obtain slightly higher wages, never attack those many members of the upper class, including many newspaper proprietors, who swan about the world as if there were no such thing as state boundaries. The competitive struggle arising out of capitalism makes the worker shun his or her foreign fellow-workers in distress, yet they welcome the wealthy idlers born at home or abroad who consume the wealth produced by the working-class. Capitalism is a frightening, hate-filled system that turns everyone's hand against everyone else. Inside socialism, where the whole Earth is the common property of the whole world's population, we will all be able to travel our planet to work wherever we desire, safe in the knowledge that our brothers and sisters will welcome us on whichever shore we land. Fact: In a survey of 15 European countries, the UN’s International Labour Organisation (ILO) found that, for every 1 per cent increase in the country’s population caused by immigration, its GDP grew between 1.25 and 1.5 per cent. Fact: According to the ILO, low skilled migrants do “dirty, dangerous and difficult jobs, which locals do not want – crop picking, care work, cleaning.” Meanwhile highly skilled migrants fill chronic labour shortages in healthcare, education and IT. Nearly a third of UK doctors and 13 per cent of nurses are foreign born. The NHS would collapse without immigrants. What of the strain “they” put on services? Not borne out by evidence. Immigrants go where there are jobs, not benefits. Fact: The World Bank estimates that if immigrants increased the workforce of wealthy countries by 3 per cent, that would boost world GDP by $356 billion by 2025. Further, a meta-analysis of several independent mathematical models suggests that removing all barriers to immigration would increase world GDP by between 50 and 150 per cent. Fact: Just 3.3 per cent of the world’s population are migrants, little more than in 1990. Even within the EU, where citizens are free to live wherever they want, only 2.8 per cent reside outside their own country. 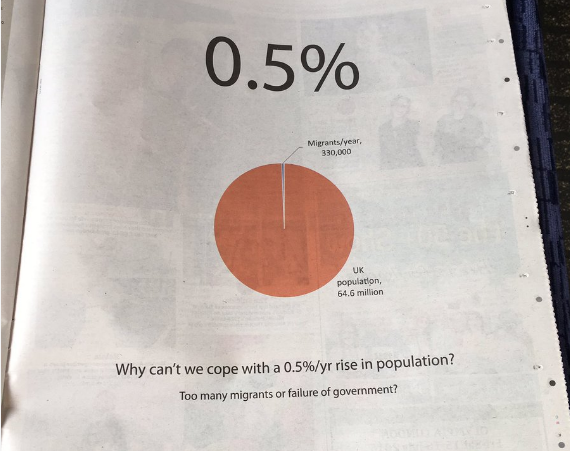 Fact: The Organisation of Economic Co-Operation and Development, which represents 34 of the world’s richest nations, calculates that its immigrants on average pay as much in taxes as they take in benefits. Research suggests that EU workers in the UK take less in benefits than native Brits do. Based on recent numbers, Britain should conservatively expect 140,000 net immigrants a year for the next 50 years. Fact: The Office for Budget Responsibility, the UK’s fiscal watchdog, calculates that if that number doubled, it would cut UK government debt by almost a third while stopping immigration would increase our debt by almost 50 per cent. Fact: Immigrants largely aren’t to blame for housing and school place shortages. These are just as much a direct result of government cuts, underinvestment and austerity. The global economic crash wasn’t caused by immigrants, either. The whole referendum is a huge irrelevancy and a waste of time. Our limited part in the campaign has been attacking those calling themselves socialists who are on the Leave side, for encouraging nationalism. In terms of the working class, the vote won’t bring socialism closer, either way, so as a class we have no specific interest in the vote. We can envisage that some workers may feel they have an interest in staying in, for instance if your job is working for the EU, or if you are in a post financed through the European Social Fund, similarly there may be those who think they may directly benefit from a withdrawal, Border Agency staff may envisage getting more overtime if we withdraw, but as a class we have no interest. Beating the anti-foreigner drum seems to be paying off. A bit disturbing. The bigots and xenophobes who seem to be swinging the vote will be disappointed, though. Even in the event of a Leave vote there will still be immigration (as British capitalism needs more workers if it is to keep growing), only it would be "controlled". This would add a new category of "illegal" immigrants too, from Eastern Europe (in fact from anywhere in the EU) to join those from Asia and Africa. The section of the police and border agency staff dealing with this will have their workload doubled (at least) as will the profits of the people smugglers. Many capitalists financing the Leave campaign are not "petty bourgeois" but mainly filthy rich financiers who don't want their activities to be regulated by the EU. They are regulation dodgers. Workers would be complete mugs to pull the chestnuts out of the fire for them. The main debate, in our opinion, is between National (relatively small capital) and multinational (relatively large capital). For those capitalists trading largely with the UK, the EU generates extra cost through regulation, etc. so they tend to be in favour of withdrawal. For multinationals the EU provides a huge standardised market and they tend to be in favour of staying in. Historically big capital wins out against small capital. Both sides are being criticised for exaggerated and unsubstantiated claims, but what do they expect? The protagonists on both sides are professional politicians used to telling lies and making false promises. They are not going to change their spots just because it's a referendum and not an ordinary election. All this is grist to our mill. Paul Mason made an interesting point: it doesn't make much difference if UK stays or goes, there is now a two-speed Europe, and the Euro/Schengen countries will continue to integrate without Britrain. It is in effect a complete waste of time and effort to vote at all in this farce, which is just a huge distraction from real issues of poverty, housing and human needs. Calling on people to stay away in their droves is a clear message, but our policy of write-in votes is about building the party's support. We don't see how much change either in or out can make. Any new 'free trade treaty' would have to inlude some element of free movement (no government wants those ex-pat Britons being repatriated); there'll have to be some sort of arbitration in any free trade treaty. This really is one for the passing show. Of course, British capitalism will survive in the event of an OUT vote and adapt, probably ending up like Norway (with access to the single EU market but no say in its rules) but, given its economic weight, something less unfavourable maybe. It wouldn't be the end of the world for them even if it doesn't make complete economic sense from their point of view. 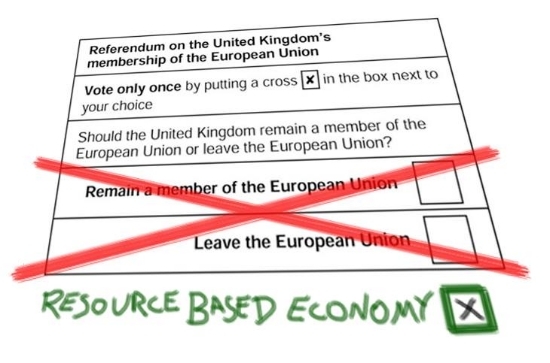 The EU referendum is just another political and economic argument amongst the boss class. 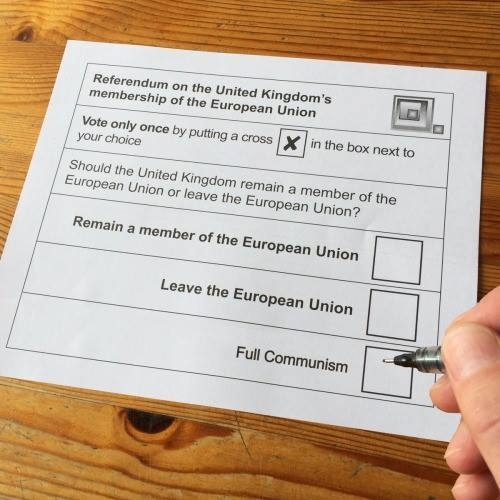 The case for voting Remain is stronger than the case for voting Leave but not strong enough for suspending our view that the "lesser evil" is not a valid argument for making a choice between two capitalist options. In or out of the EU does not restrict the class struggle. And we don't say it’s "nothing to do with me" what we are saying is to abstain from the bosses struggle(s) and support the struggle for socialism. (2) to protest against the xenophobia behind the Leave case. People will make up their own mind how much weight to attach to these. Even in the event of a Leave win, the free movement of labour stands a good chance of staying. British capitalism needs free access to the single market and there's no chance they are going to get this unless they agree to the free movement of workers. Britain withdrawing from the EU may give an elected government here more formal control over what it decides but not any more real control as it's not governments that control the way capitalism works but the other way wrong as governments are forced to give priority to profits and conditions for profit-making. As a capitalist trading nation on its own outside a bigger block Leaving might even give the government less control. The argument is also based on the illusion of "reformism in one country" which has tried and failed many times. You can't fight capitalism exclusively in one country. 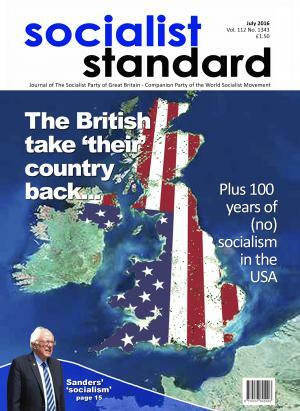 For the same reason you can’t have "socialism in one country" despite what the Stalinists say. This strand of leftism that has been drawn to state capitalist versions of what it misleadingly calls socialism has been a constant source of confusion from the word go. The referendum debate, if nothing else, is bringing all sorts of things out of the woodwork. 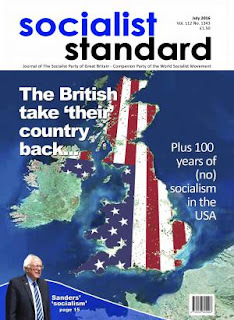 Nationalistic claptrap inspired by nationalist sentiments have got sod all to do with socialism and are anathema to everything socialists stand for. Some left-wingers place themselves in the Leave camp on the specious ground that this would enhance "popular sovereignity" and "democracy in one country" Even if it was the case, what difference would a slightly enhanced political democracy in Britain make? The traditional leftwing/Social Democrat policy of "reformism in one country" has always failed, one reason being, precisely, the international nature of capitalism. Which would remain the case and in the end force any breakaway UK government to put profits before people to maintain or enhance British capitalism PLC's competitiveness on world markets, which has been the fate and experience of all Labour governments here. If British capitalism left (and if it is decided not to protect UK farmers – a big IF) there would be lower food prices. But this would not benefit workers. Lower food prices by reducing the cost of living would lead to lower wages, leaving workers in the same position as before. So, while this might earn them a point against the Remain camp, it cuts no ice from the working class point of view. We are not going to waste valuable time advocating versions of capitalist management over workers there are too few socialists as it is. European capitalism or world socialism ? MILLIONS ARE BEING CALLED UPON TO CHOOSE BETWEEN STAYING IN OR EXITING THE EU. Such differences as may exist between them are about how to administer this system. none wish to go beyond the wages-prices-profits system. BOTH CAMPS want to retain producing for the market, buying and selling, money and working for wages. None of them – not even those who describe themselves as “socialist” – stand for socialism in its original meaning of a society of common ownership and democratic control with production for use not profit and moneyless distribution in accordance with the principle “from each according to their abilities, to each according to their needs”. But, you may ask, what’s wrong with capitalism? What’s wrong with capitalism is that it is based on class privilege and exploitation. 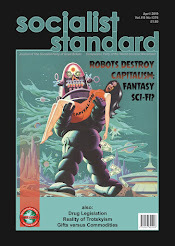 The means of wealth production – the means by which society survives – are monopolised by a tiny minority of the population, either directly or indirectly via the state, with the result that the rest of us have to sell our working skills to them for a wage for a salary which can never be equal to the value of what we produce – otherwise there would be no profit, the source of their privileged income and the overriding aim of production under capitalism. What’s wrong with capitalism is that its competitive struggle for profits leads to speed-up, stress and insecurity at work, to damage to the environment, to wars and the waste of preparations for war that arms spending represents. Capitalism can only work in the way that it does work – as a profit-making system putting profits before everything else – and cannot be reformed to work in any other way. This is why changing governments changes nothing. Governments, whatever their political colour, cannot alter the economic laws of capitalism. Just the opposite in fact. They have to apply these laws, as we have seen many times when governments elected on a promise to reform capitalism to make it work in the interest of all have ended up squeezing wages, state benefits and public services in order to protect profits. No doubt in some cases the members of these governments – like some of the candidates in this election – were perfectly sincere. But that’s not the point. It’s not a question of what they want to do, but of what they can do – or rather cannot do – within the framework of the profit system. Capitalism simply cannot be reformed to work in the interest of the majority class of wage and salary workers. Which is why we in the World Socialist Movement say workers should organise to end it, not to try and reform it. But hasn’t socialism been tried and failed? Certainly not. What was tried and what failed in Russia and Eastern Europe was not socialism, but state capitalism under the dictatorship of a single political party. What happened in these countries proved, not that socialism cannot work, but that not even the most ruthless political dictatorship can make capitalism work in the interest of the majority – since the economic system in Russia was always based on capitalist principles: goods and services were produced for sale and people had to sell their working skills for a wage in order to get money to buy the things they needed to live. True, there was essentially only one big employer, the state, but, as with private employers in the West, the aim was to make a profit, out of which the privileged nomenklatura that controlled the state maintained itself. Real socialism, we repeat, is something quite different. It is a world without frontiers, without armed states, without privileged classes, where the resources of the Earth have become the common heritage of all the people of the world and are used for the mutual benefit of all. This is the only framework within which the problems facing humanity in general and working people in particular – stress at work, inadequate public services, war and the threat of war, ecological destruction, world hunger, and the rest – can be solved. Which is why working towards this goal is ultimately the only constructive and worthwhile political activity. It is not up to us to tell you how to vote in the referendum. If you see no alternative to capitalism no doubt you will vote for one or other of the options on offer. 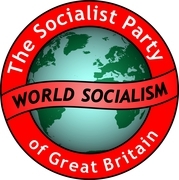 If you want socialism, you can indicate this by writing “WORLD SOCIALISM” across your voting paper. 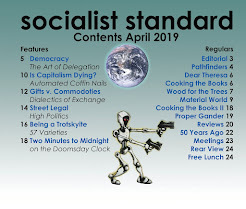 But, more important, we would urge you to get in touch with us at spgb@worldsocialism.org or at 52 Clapham High Street, London, SW4 7UN, Great Britain, with a view to finding out more about the alternative to capitalism. You can also find out more about us at: www.worldsocialism.org . Camp Polonia (now called Campolo, though the origin of that name is no longer widely known locally) was a district of Ahvaz, Iran, which housed Polish refugees during World War II. The Poles have forgotten their own history and forgotten the debt they owe Muslims. Europe - or the world? Britain First or Humanity First? The European Union: A bore or an opportunity?